As Francis continues to do whatever he pleases and to say whatever he feels like saying, even when he is aware that “it may sound… heretical,” the sense that the Church has “lost its compass” and is now “a rudderless ship,” as noted by Cardinal Burke, continues to spread among the faithful and a growing number of priests, bishops and cardinals. Further steps toward unity? Is this a joke? 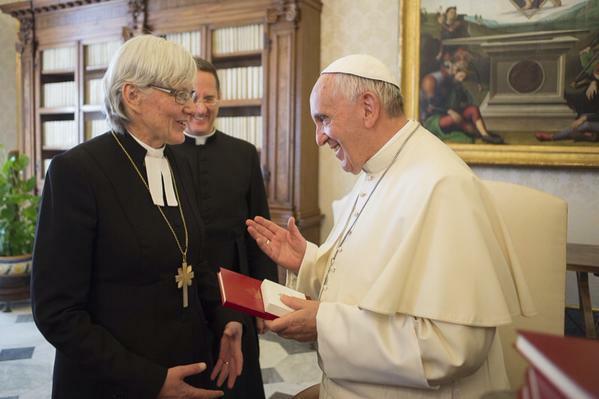 The followers of Luther have been moving ever further from any possibility of unity with Catholics precisely in proportion to the length of time the disastrous “ecumenical venture” continues to confirm them in their multiplying errors. What is it but sheer madness that confronts us now? Where are the cardinals and bishops with the courage to stand up in open opposition to this Pope and defend the Church against his almost daily abuses and scandals? Merely for delivering a series of sermons that argued against the immediacy of beatitude for the blessed departed even after Purgatory, John XXII was publicly denounced by prelates and theologians, and there were calls for a council to condemn him on account of heresy. As members of the laity, we can do nothing but protest the words and deeds of Francis, which we certainly must do in keeping with our Confirmation vow to be soldiers of Christ. But only concerted, direct opposition by members of the upper hierarchy has any chance of reining in this clearly out-of-control pontificate and limiting further damage to the commonwealth of the Church. To the prelates who know the gravity of our situation and are admitting it privately, I must ask: What are you waiting for?